Just before we had our first child, a neighbor gave us their umbrella stroller. It was a fine little stroller. It worked well, and it was free (which is my favorite price). We used it for walks around town. I tried to use it for jogging, once, and within 100 feet, I knew I had made a bad choice. After my second child had used it, the straps were broken, the handlebars had worn down to the metal, and the seat had some serious tears. It was time for a new stroller! 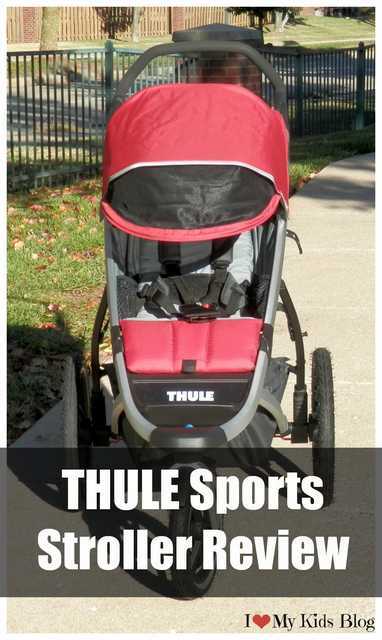 I got the opportunity to try the Thule Urban Glide Sports Stroller. 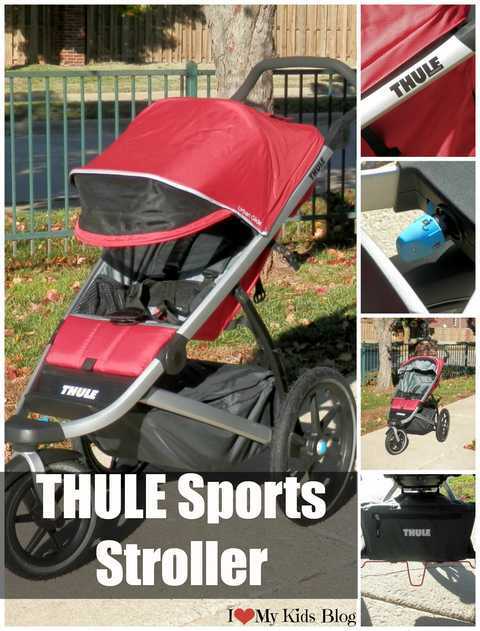 Thule is an industry leader in providing products for active families and outdoor enthusiasts. They are known for their quality and innovation. 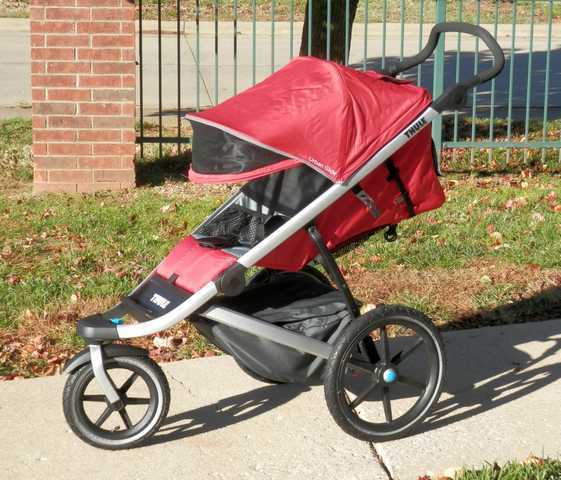 The Urban Glide is a gorgeous stroller that comes in three colors: Dark Shadow (gray), blue, and Mars (red). The first thing I noticed about the Urban Glide is how lightweight it is. Weighing in at only 23 pounds, it is easy to lift up and down the stairs and into vehicles. Even though it is extremely lightweight, it can safely hold a passenger weighing up to 75 pounds. The Urban Glide came fully assembled, except the two back wheels. To assemble to back wheels, I simply pushed a button and slid the wheel into the slot. It clicked into place and was so simple! The front wheels are 12 inches in diameter and the back wheel are 16 inches. They are the perfect size for handling uneven terrain and the bumps and jostles of walks in town. Another fantastic feature of the Urban Glide is the multi-position canopy. Most stroller canopies are tiny, useless little things. This canopy is perfect for shading your child anytime of day, no matter which direction you are traveling. The canopy also includes a peek-a-boo window, so you can keep an eye on your little one. The Urban Glide also features large storage compartment. The compartment has a stiff plastic floor. This helps the compartment keep its shape and prevents it from sagging. The compartment can be kept open or zipped shut, and features a smaller pocket for your wallet, cellphone, and keys. Our last stroller didn’t recline. This caused problems, when my children fell asleep. Their poor little heads would slump to the side. When I tried to adjust them, they would wake up and cry. The Thule Urban Glide can be reclined with one hand. It is a smooth transition, perfect for lowering your sleeping child without waking them. Once the padded seat is reclined, there is a mesh window that can be opened to improve ventilation. Finally, the Urban Glide has a really nifty little button in to front for locking the wheels. 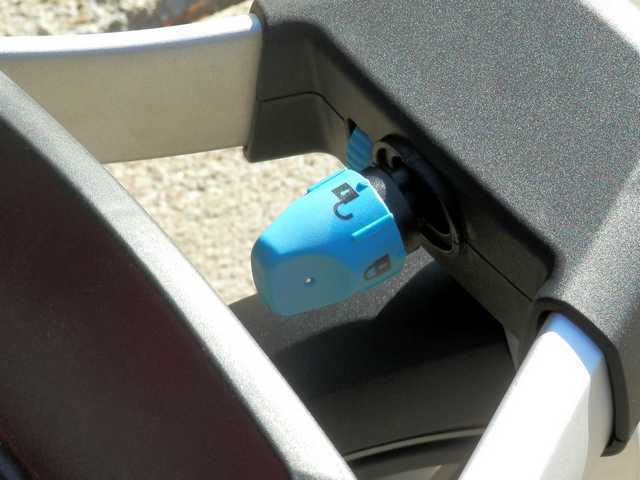 This makes it simple to adjust from a swivel wheel to a locked wheel for jogging. There is a small dial that will also adjust the veer of the wheel. This would be fantastic to make sure the front wheel is veering away from traffic or while doing laps on a track. 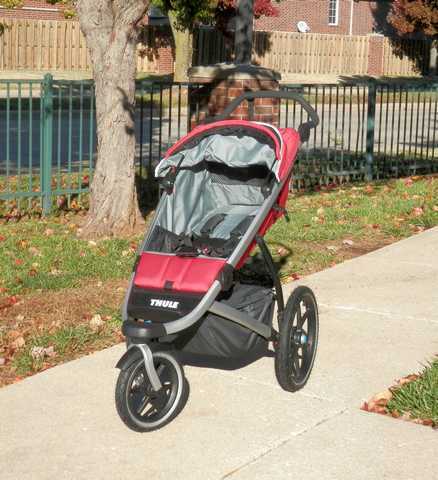 The Thule Urban Glide is an amazing stroller. It is lightweight, sturdy, has a sleek design, and it is packed with useful features. It has been great for walks around the neighborhood, while shopping, and on rougher terrain. The Thule Urban Glide retails for $399.95. Disclosure: I received the item above, to facilitate this review. I was not required to provide a positive review. All opinions honest and my own. 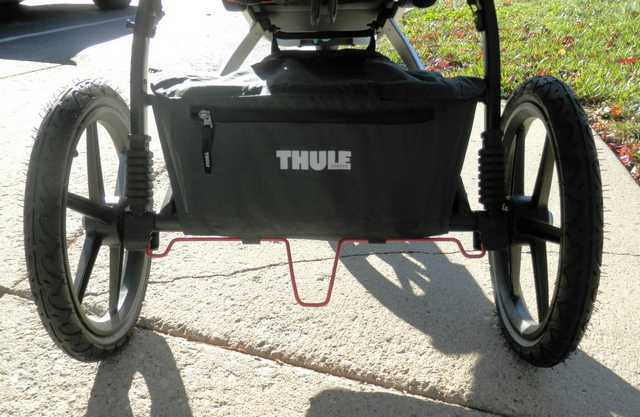 Win a Thule Urban Glide! This is a HUGE giveaway for us. 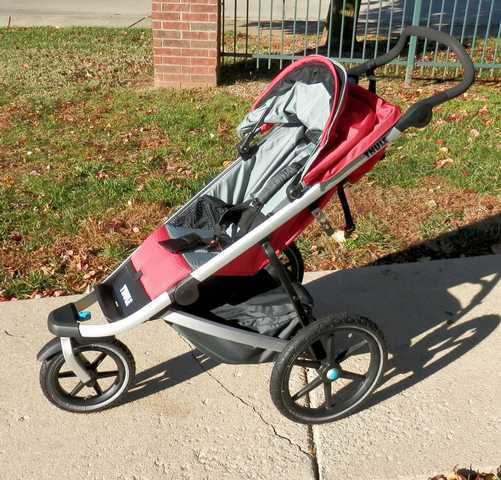 We’re so excited to get someone else running with this stroller! My niece is expecting her first baby. This stroller looks very sturdy and would last thru many children. LOL that is where I left my fb comment? did you want that link? Oh i’m not good at this stuff. I sure want to win this. I want a jogging stroller SO bad. I think its important to start you teaching babies toddlers importance of walk exercise setting an good example of all. this is really neat! Would love to have one and try it out!!! Can I leave my comment here instead as I do not use facebook? I’d absolutely love to enter this! Thanks. What a neat stroller. Would love to have this!!! I know several expecting mothers and this would be an awesome gift! Love this stroller . It really is so cool looking.